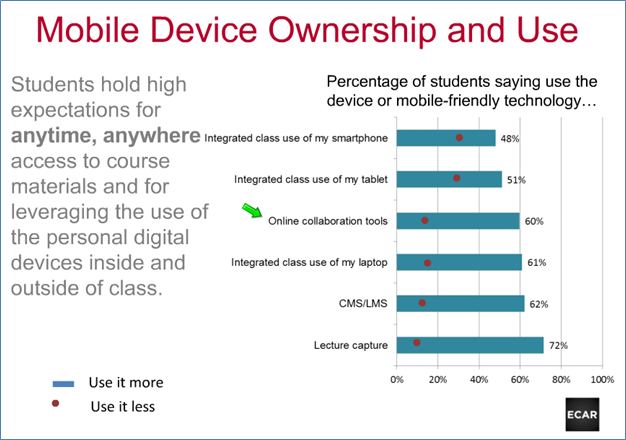 EDUCAUSE Center for Analysis and Research (ECAR) conducts an annual survey of undergraduate students regarding their use of technology. Read more about the 2013 study. 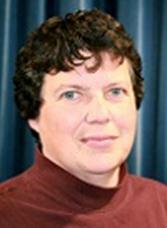 In this post I give some commentary on the data presented by Eden Dahlstrom, Director of Research at EDUCAUSE, in her 11/12/2013 webinar. Want to watch the very well-done, hour-long webinar? Watch it here. Want to just see the slides? They are here. 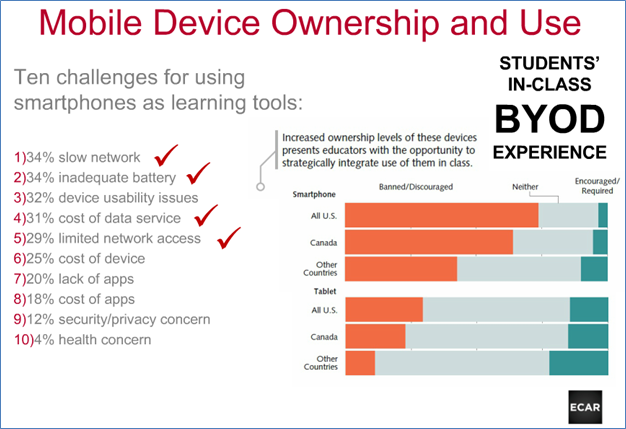 In 2014 EDUCAUSE will include a faculty study. Want to participate? The slides are ECAR’s; the commentary is mine. 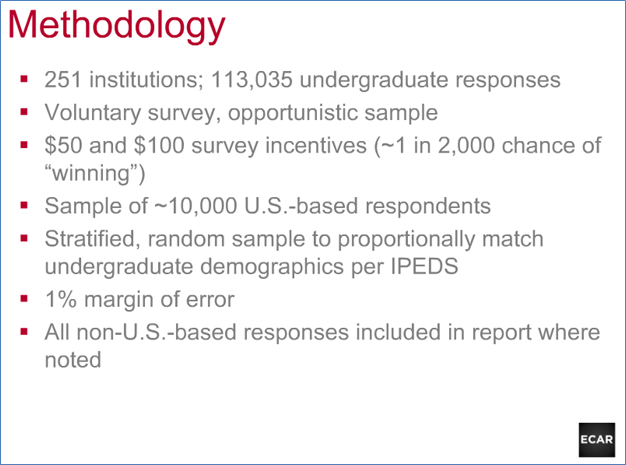 Here’s the survey methodology for the 2013 student survey. 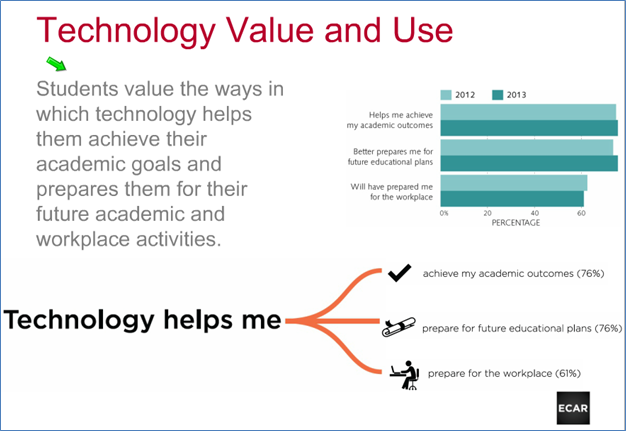 Students see the value of technology, although only 61% perceive it as helping them “prepare for the workplace.” Is this because students don’t know what technology is being used in the workplace? Or even what their future workplace will look like? Two-thirds of students that we, as faculty, “have adequate technology skills,” “use technology effectively,” and “use the right kinds of technology.” What do the other 1/3 think we should be doing? But what’s most fascinating is that only 52% think we “have adequate technology training.” What are those 52% of students seeing that make them think that? Are we fumbling too much with the classroom computer? Are we being compared to their instructors who are early adopters of technology? 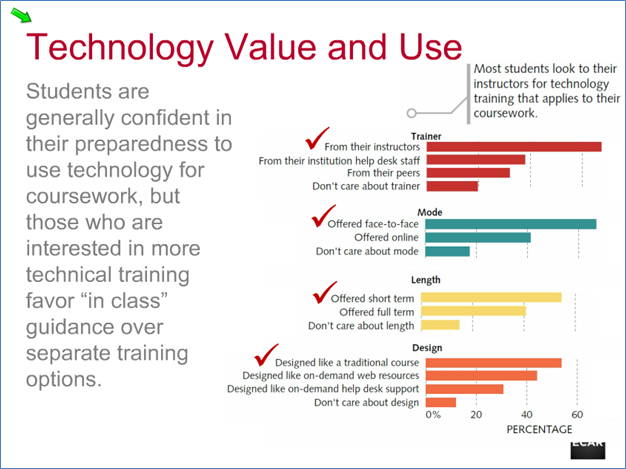 Even though half of our students don’t think we’re adequately trained, more than 2/3 want us to train them in the use of technology. I’m not entirely sure what to make of these data. 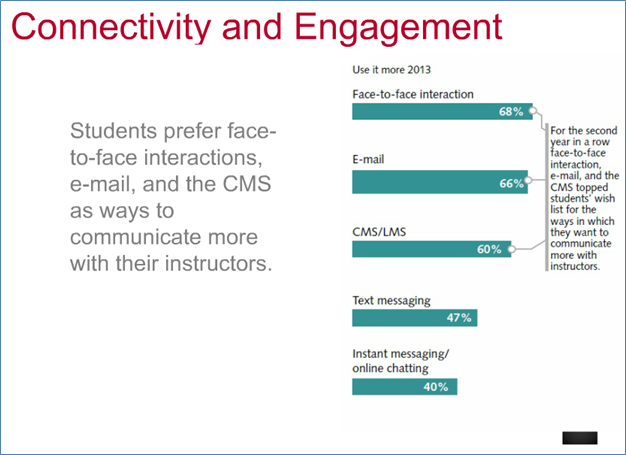 It sounds like 60% or so of students would like to have a technology module added to their face-to-face content courses. 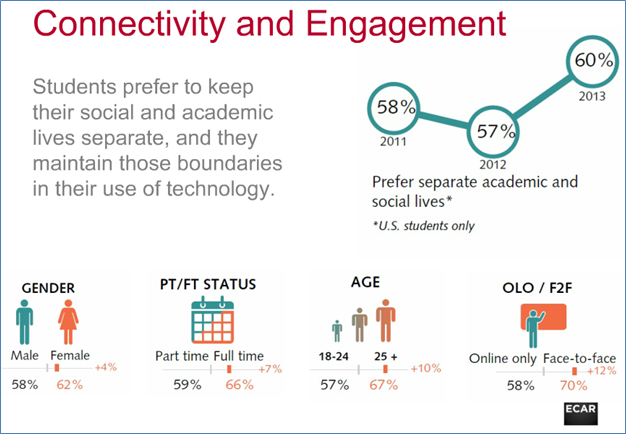 The student/technology landscape changed considerably between 2010 and 2013. Course/learning management system (CMS/LMS) use jumped from around 73% in 2011 to about 97% in 2012. Interestingly, that number dropped to 91% in 2013. This could just be sampling error. Or it could be a reflection of an actual drop in the number of faculty using a CMS/LMS. 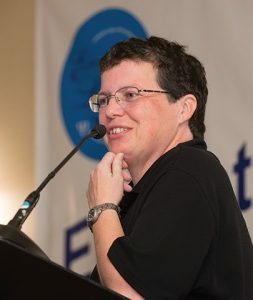 Anecdotally, I have been hearing from more and more faculty who are interested in developing their own websites. 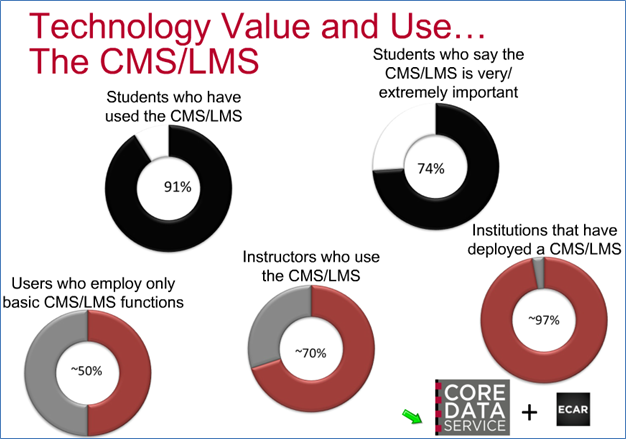 Partly it’s driven by wanting to make content available to students before/after the course is over, partly it’s driven by a frustration of updates to their institution’s CMS/LMS or movement to an entirely different CMS/LMS platform, necessitating a boat-load of work on the part of the faculty to port their courses. Less surprisingly we see big jumps in the use of web-based citation tools and e-books. For those who aren’t familiar with those web-based citation tools, look for an upcoming blog post on that topic. This was the first year for the open education resources and simulations or educational games options. I’m curious to track those responses in future surveys. CMS/LMS use is high, although about half of us are not using their full potential. And 2/3 of students think we should use them more. I’m not sure what features students would like us to use, though. This is an opportunity to check in with your own students. If you aren’t using a CMS/LMS, would your students like you to? If so, why? 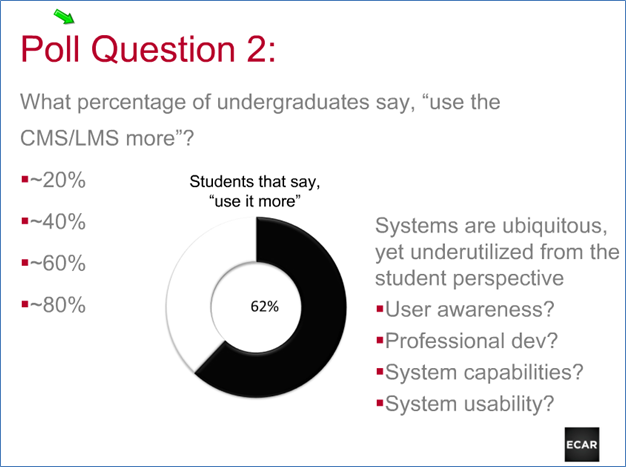 If you are using a CMS/LMS, do your students want you to “use it more”? If so, what would they like? 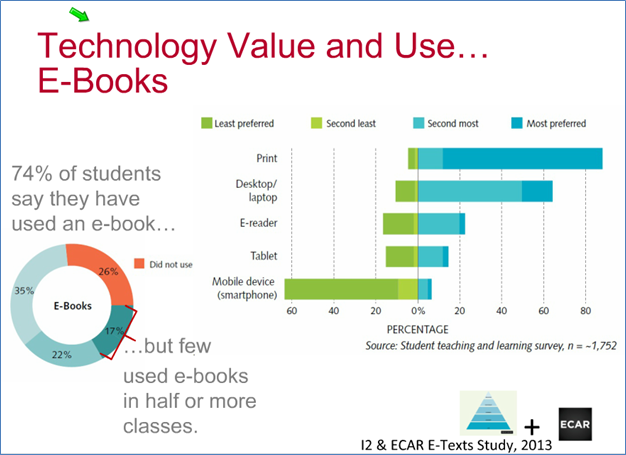 Students overwhelmingly prefer print books over digital. If they have to go digital, they prefer to read on a desktop/laptop. David Daniel, psychologist at James Madison University, has data on the difference between reading a textbook in print versus reading a digital version; it takes students longer to read a digital version. I’m not all surprised that reading a textbook on a smartphone came in last – tiny print and frequent page turns. If you increase the size of the print, you have to turn the page even more frequently. 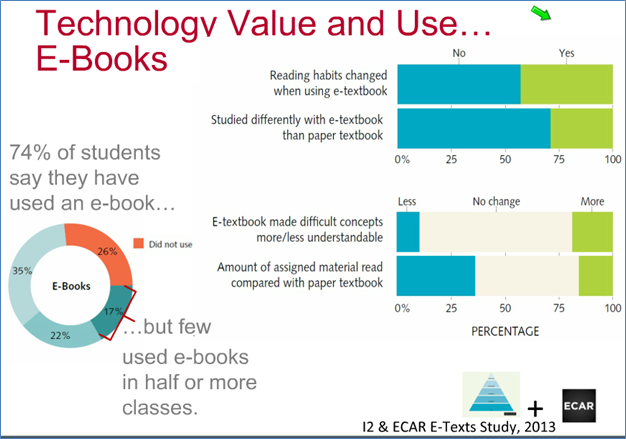 Almost 75% of students say they “studied differently with e-textbook than paper textbook.” Given the number of students who prefer print textbooks, “differently” was evidently in a less desirable direction. Students aren’t impressed with the “features” that may be packaged with e-books. 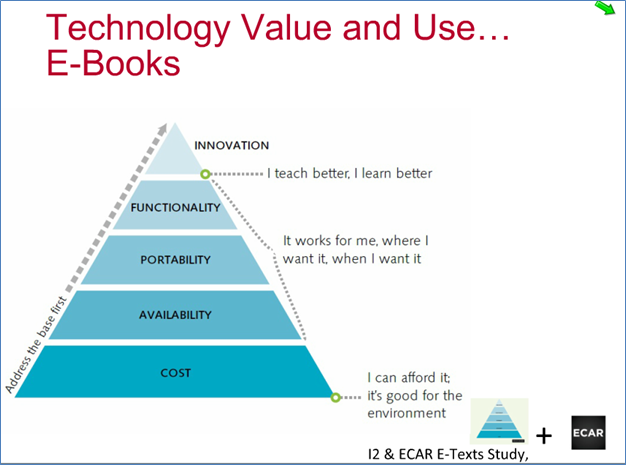 Largely if they’re using e-books it’s because they’re less expensive. David Daniel has also found taht those “features” in e-books serve as a distraction. If I’m reading, I want to read the narrative. I don’t want to stop mid-paragraph to click on a link to a video or mouse over a word for a definition. If I do that, I lose the thread. I recently read “The Telling Room” where the author made liberal use of footnotes. He used them purposefully as a distraction from the main text, and that they were. I finally got to the point where I skipped the footnotes until I had finished a chapter. A big deal has been made of “digital natives.” If you’re a follower of this blog, you know my thoughts on this already. People know what they know. Younger students are masters at texting and downloading music. 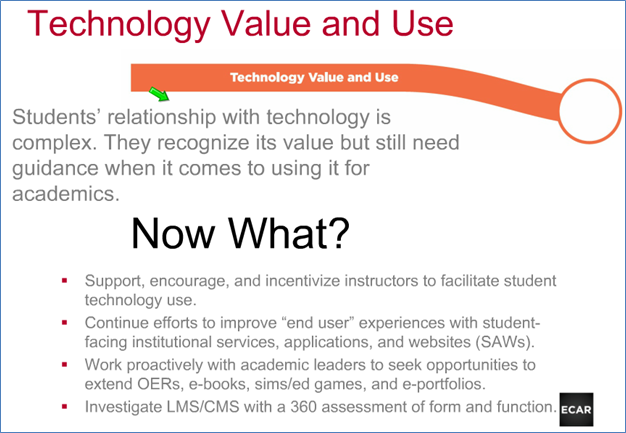 That does not mean that they know how to leverage technology to help them learn. 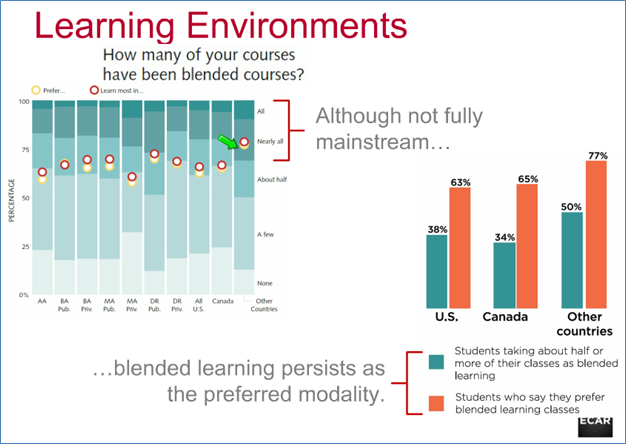 Students perform better in hybrid courses compared to online or face-to-face courses. See South Texas College, for example. You can find additional references in this 2004 Academic Quarterly article. 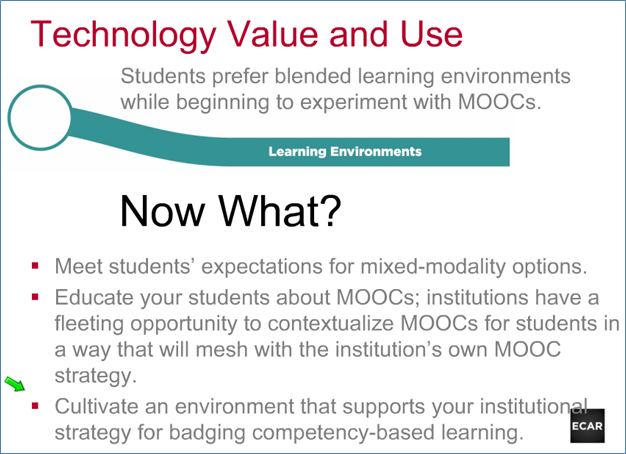 MOOCs are a tiny piece of the puzzle. While the number of students taking a course completely online may increase, I don’t anticipate MOOCs having too much impact on undergraduate education. 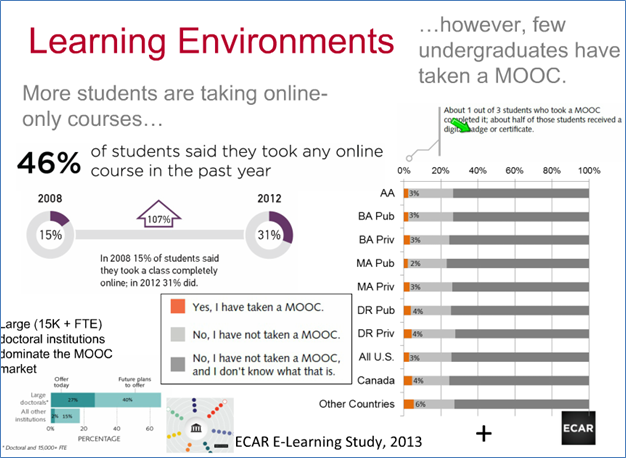 Who are taking MOOCs? People who already have degrees or people living outside the U.S. Read more here. Students are ready to use more technology in their courses. 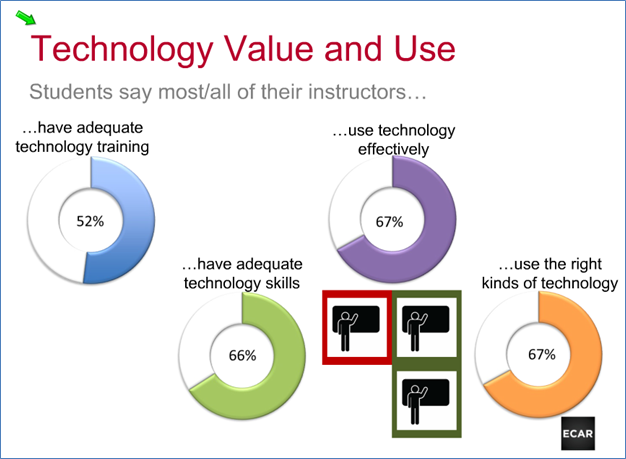 Do faculty know how to make use of those technologies? 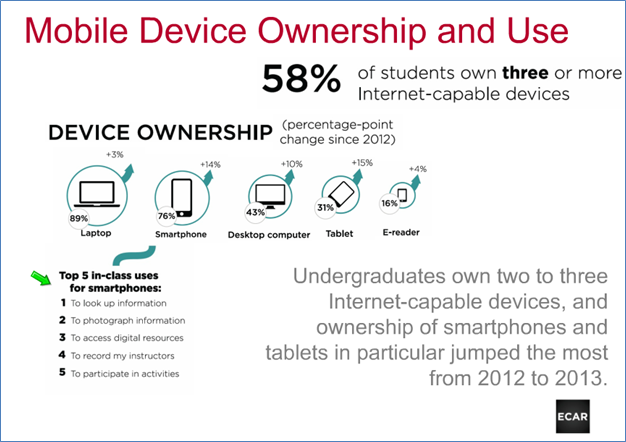 I’m not surprised at the increase in the number of students who have smartphones. The increase in the number of desktops does surprise me, though. I’m not sure why it should. After years of being desktop-free, we recently bought a desktop for my wife’s office. (Shout out to Puget Systems who custom-built it.) Desktops have a lot of power for a lot less cost. With cloud-based email and file storage, the need to have a laptop as one’s primary computer is behind us. Students seem pretty comfortable mixing and matching operating systems. 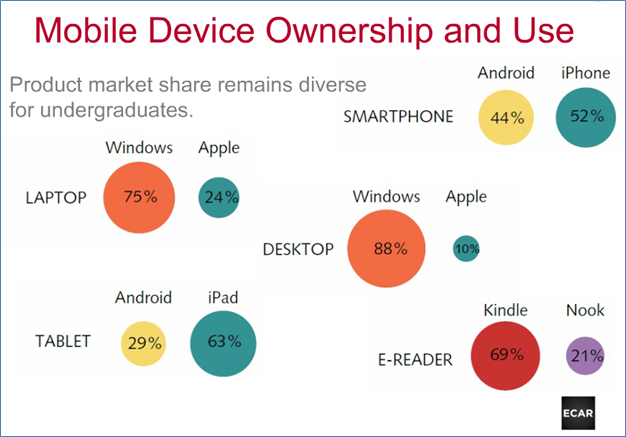 Laptops and desktops are Windows, tablets are iOS, and smartphones lean toward iPhone, but Android has a healthy share of the market. The checkmarked items are ones institutions can help with. With better campus wi-fi we eliminate “slow network,” “cost of data service,” and “limited network access.” While we can’t improve battery life, we can go the route of airports, and make more outlets available. One person in the webinar said that his institution’s library has installed charging stations. 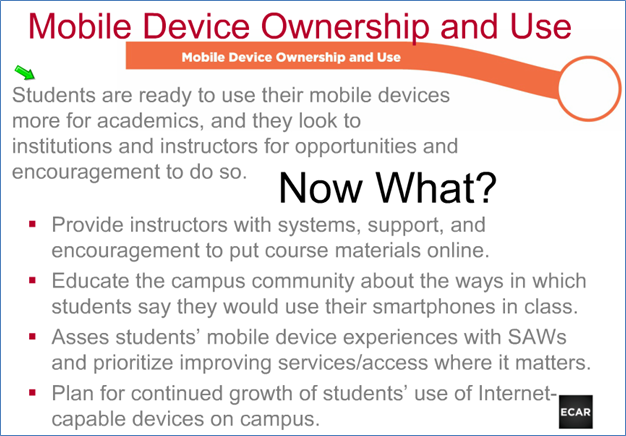 What are you and your institution doing to make use of student-owned technology? 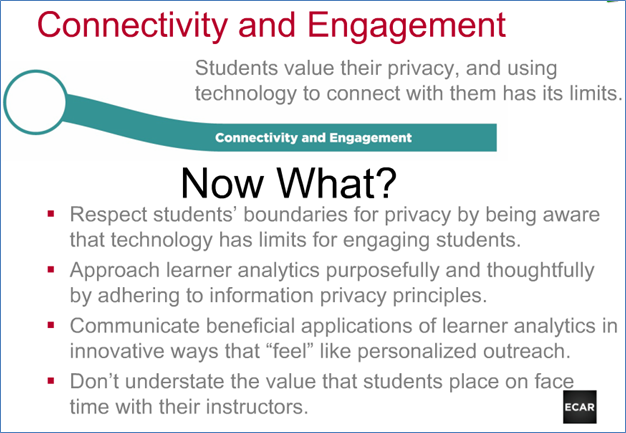 I am surprised that students aren’t using technology to connect more with other students. 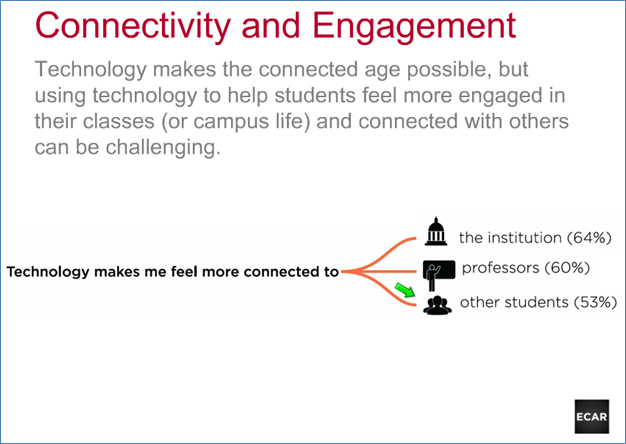 What can we as faculty do to foster greater communication among and between students? I can’t blame students here. I also prefer to keep my social and academic lives separate. These graphs seem to be largely a lesson in normal distributions. 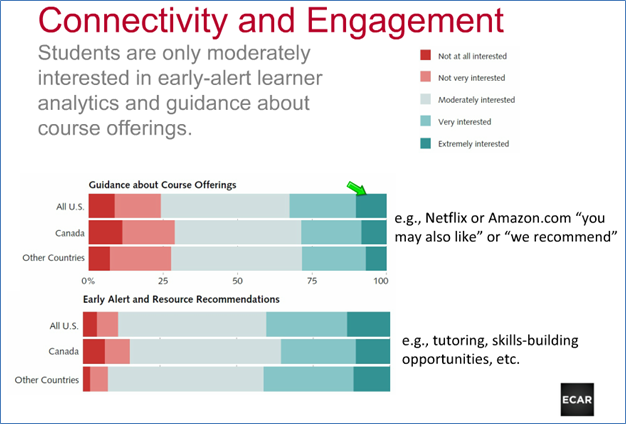 The early alerts graphs skew more toward desiring these resources, though. There is a lot to think about in this data. In the comments, please add your reactions to the survey results. Are you going to do anything differently with your students?